Since 1931, JBI has enabled visually impaired, blind, physically handicapped and reading disabled individuals of all backgrounds and ages to participate fully in educational, cultural and communal life. Today, our unique programs enrich the lives of 35,000 individuals throughout the world. 1931 The Jewish Braille Institute founded by Leopold Dubov, the blind son of a rabbi, with the help of Rabbi Michael Aaronson, who had been blinded in World War I. 1940 JBI develops Hebrew Braille Code. 1950 First Braille edition of the Torah is published by JBI. 1960 JBI begins recording Talking Books and inaugurates its audio magazine, The JBI Voice. 1968 JBI moves headquarters to 110 East 30th Street in Manhattan. 1975 JBI convenes first World Conference for the Jewish Blind in Jerusalem. 1980 JBI is accredited as a Non-Governmental Organization by the United Nations. 1983 JBI establishes first Low Vision Clinic in Israel. 1987 JBI publishes first Large Print edition of the Torah in English and Hebrew. 1988 JBI launches Audio Cultural Series. 1991 JBI sponsors recording complex for blind students at Hebrew University. 1992 JBI begins recording in Russian, Romanian and Hungarian and extends its program to the Former Soviet Union and Eastern Europe, thus providing thousands with access to cultural materials that they had been denied for so long. 1993 JBI establishes Wolfson Recording Studio at the Central Library for the Blind in Tel Aviv. 1998 JBI begins recording major Jewish journals, now known as The FJC Periodicals Series. www.jbilibrary.org brings library catalog on-line. 1999 JBI begins sponsoring summer recreational retreats for blind and visually impaired elderly Jews in Russia. 2000 JBI opens first of 80 NYC "mini libraries" in UJA-Federation agencies with a matching grant from the Harry & Jeanette Weinberg Foundation. 2001 U.S. Library of Congress National Library Service for the Blind and Physically Handicapped names JBI one of only two "Affiliated Libraries." JBI establishes the first of over 50 Book Clubs for the visually impaired. JBI records the first Jewish Library in Russian for blind children. 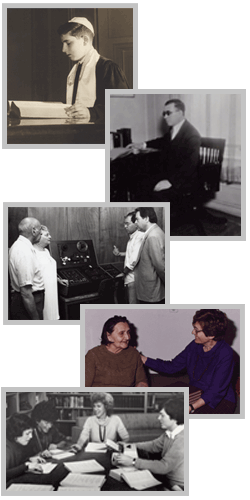 2002 The Jewish Braille Institute officially renamed JBI International. JBI Low Vision Clinic begins its Mobile Screening Program to bring free access to first-rate eye examinations and any follow-up treatment to elderly in Tel Aviv/Yafo area. 2003 JBI establishes outreach program in Florida for the elderly visually impaired with the help of the Weinberg Foundation. The Barbara and Stephen Friedman Talking Books Endowment created. 2004 JBI launches www.HebrewVisions.org now to give 24 hour/7 day a week access to downloadable Braille texts. JBI studios convert to digital recording. 2005 JBI begins recording in Spanish and expands its programs into Latin America. 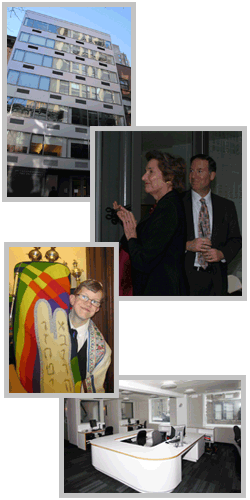 2006 JBI creates dedicated Children's Low Vision Clinic at Sourasky Medical Center in Tel Aviv. 2008 Renovation and expansion of JBI's East 30th Street international headquarters. October 16, 2008 - JBI celebrates the ribbon cutting and official dedication of The Harry and Jeanette Weinberg Building of JBI International. "I wanted to thank you sincerely for all that you do to help vision impaired and blind Jewish children and adults feel part of the Jewish community. My son, Jack, will be having a Bar Mitzvah on June 1st and this absolutely could not have happened without JBI."